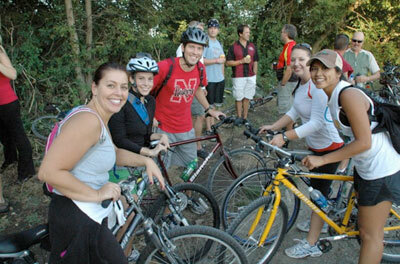 PICK OF THE WEEK May 12 and 19 Taco Ride Wabash Trace Nature Trail Common start time between 5:30-6:30 p.m. $1 daily trail pass/$10 annual Thursdays through fall, tacoride.com This notoriously fun jaunt was popularized when cyclists’ passion for physical activity merged with their hunger for cheap tacos and beer. Work up your appetite for the latter on the 10-mile trek through the scenic Loess Hills between Council Bluffs and Mineola, Iowa. Meet your friends and fellow riders at the Mineola Steakhouse for taco and beer specials, plus a little rambunctious festivity, before returning to where you started. In addition to those specials, the establishment offers a full menu of food and drinks, outdoor and indoor seating and, on most nights, karaoke. Be sure to visit TacoRide.com for tips and further details on how the taco ride rolls.